With under 20 minutes left in the match at Jordan Field, the ball fell to a Cornell player at the top of his offensive box. He immediately let loose a shot, one that seemed destined to nestle into the top corner, but Harvard sophomore goalkeeper Matt Freese had other ideas. Freese’s acrobatic leap and outstretched fingertips allowed him to deflect the shot off the crossbar. However, the ball bounced back into play and Big Red sophomore forward Charles Touche was the first to react, pouncing on the opportunity and heading the ball into the net to complete his hat trick. This moment captured the spirit of Saturday’s contest between the Crimson (3-7-0, 1-1-0 Ivy) and Cornell (8-2-0, 2-0-0). 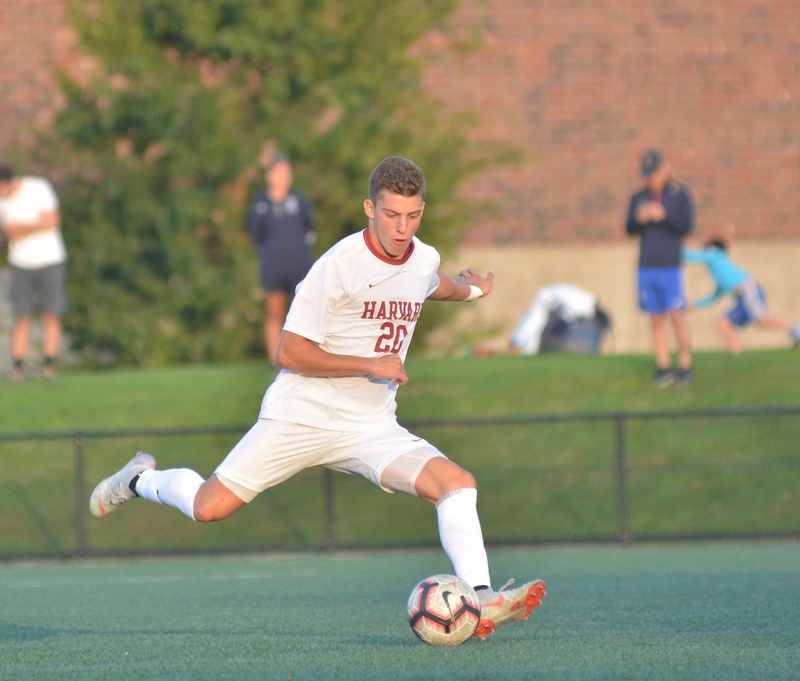 Harvard put up a fight for the full 90 minutes, yet the nationally ranked Big Red team always seemed to be one step ahead, imposing its will on the game and earning a 4-2 victory. This intensity was evident early on as several physical challenges by Cornell set the tone and reminded Harvard what team it was playing. The Big Red was quickly rewarded for its fast start with a set piece on its left wing in the ninth minute. As the ball was swung in, a sea of red shirts was there to meet it, and Touche was the one to steer it past Freese with his head to open the scoring. The first half was going Cornell’s way until the 38th minute when the Crimson was able to capitalize on a mistake. After defending a set piece in its defensive third, Harvard quickly went the other way, springing into a counter attack. A Big Red defender snuffed out the danger but his poor clearance popped the ball up into the air. Having just been subbed on a few minutes earlier, Crimson freshman forward Nico Garcia-Morillo gathered up the ball and slotted it past the goalkeeper to even it up at 1-1. This goal galvanized Harvard, as the hosts finished the half with much more energy and confidence than before. The two sides were fighting neck and neck, but it only took three minutes in the second half for Cornell to separate itself again. A solo effort by Touche on the left wing proved to be successful. He took on his defender with pace, cut in on his right foot, and found the back of the net to add his second goal of the game. 25 minutes later he would complete his hat trick, leaving things looking gloomy for the Crimson at 3-1. Nevertheless, the game was far from over. Harvard became much more aggressive as it was forced to take risks to get back into the game. Garcia-Morillo, a bright spot for Harvard on the day, would help convert one of these chances in the 83rd minute. He cut the ball back to freshman forward Alfred Perez inside the box. Perez, who found himself with enough time and space, finished it off to breathe some life back into the Crimson. The hope for a comeback was short lived as less than a minute later the Big Red won a penalty kick. Sophomore midfielder Harry Fuller stepped up for Cornell and calmly converted the spot kick to increase the lead to 4-2, which is how the game would conclude. The Big Red proved its class with a dangerous combination of skill and tenacity, showing why it entered the contest ranked as it was. Harvard, meanwhile, earned its first conference loss of the season, reminding the team of the work ahead. “Our time on the field is short… we have half the season left and it’s time to turn it up, all or nothing,” Farias said. Harvard’s victory over the Big Red (12-10, 4-4) makes it a three-team race for the conference title down the stretch as Princeton, Penn, and the Crimson all sit with only one Ivy League loss to date. It was the second year in a row that Harvard overcame a large second half deficit to beat the Big Red in the final seconds. With Aiken running the show, the Crimson stymied Cornell down the stretch, holding the hosts to two points in the contest’s final 5:09.